Sophisticated household robots are only just starting to show up in our lives, but all the building blocks for a veritable “Cambrian explosion” of robotics are there, as Gill Pratt described it when he was running the recent DARPA Robotics Challenge. The service robotics industry IS emerging, and we will soon be seeing robots of all shapes and sizes making their first forays into our everyday lives. This is borne out by the recent explosion in robotics and AI funding, which saw robotics investments increase exponentially over the last five years. While approximately $1 billion was invested in robotics between 2009 and 2014, roughly the same amount was invested in 2015 alone and 2016 is on track to double the total investment again. According to the CBInsights October 2016 report into “The State of Enterprise: Robotics”, these new investments are largely clustered in autonomous vehicles and the service robotics industry, with strong growth noted in enterprise focused robotics companies. 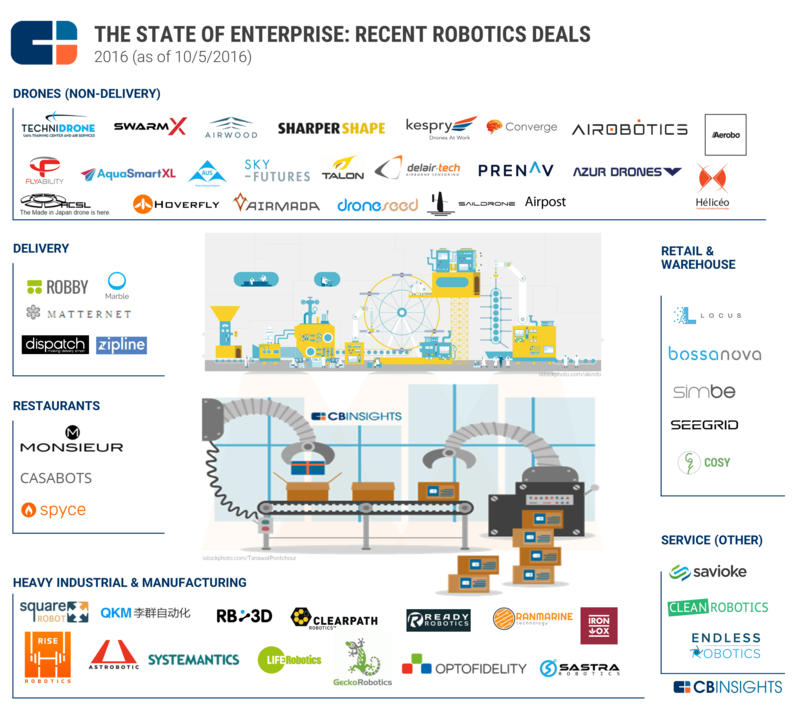 “Over 50 enterprise-focused robotics companies have raised $259M across 63 deals this year (as of 10/5/2016). These companies are building robots for industrial automation, manufacturing, warehouse automation, and restaurant services, among other tasks. As few as five years ago, the robotics landscape looked simple. While drone and autonomous vehicle technologies were beginning to emerge and cause some excitement, most of the robotics industry was industrial, and the remainder of the landscape was comparatively arid and boring: a few hospital robots, some robot vacuum cleaners, and a few toys and educational robots. The emergence of the service robotics industry as a serious economic force has taken many people by surprise. It has also made it more difficult to make sense of the robotics landscape, particularly because the new service robotics businesses impact so many markets and applications, making categorization and statistics difficult to obtain, and trends hard to analyze. The impact of the internet on the retail sector is a marked example. 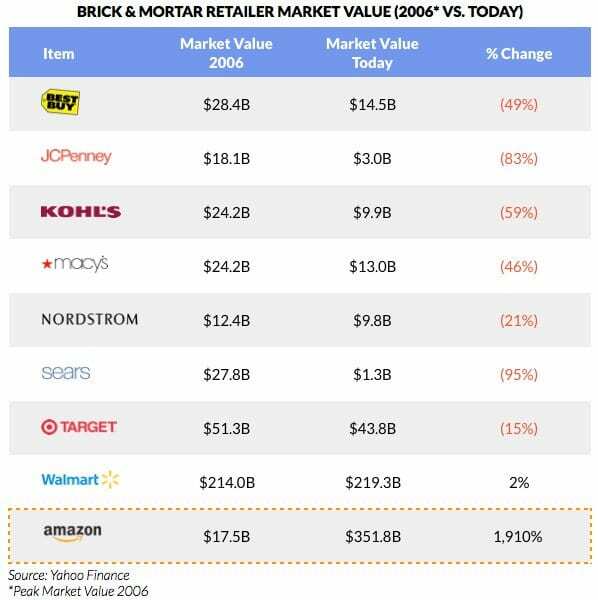 The demise of physical retail has been hyped since the first dot com bubble, and perhaps this hype has lulled us into a false sense of security. But the huge decline in value of most major US retailers over the past decade is simply shocking. At the same time, robotics offers a potential solution to the pending economic disaster that is threatening the bricks and mortar retail industry. Early signs indicate that robotics is bringing manufacturing back to the US, enabling small batch, just-in-time production in a range of areas from automotive to electronics to biomedical. Now it seems service robotics solutions in the retail and consumer spaces are offering new ways for brick and mortar companies to likewise maintain their competitive edge. And helping to shape these solutions are a number of Silicon Valley startups featured in this report: Catalia Health, Cleverpet, Bossa Nova, Fetch Robotics, Savioke, Marble, Dispatch, Dishcraft, Momentum Machines, Eatsa, Fellow Robots and Simbe. Indeed, Silicon Valley is at the epicenter of emerging service robotics industry. 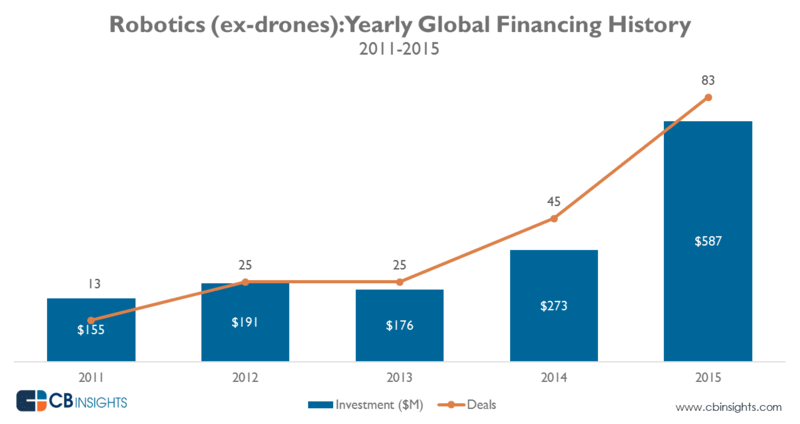 Since 2010 Silicon Valley Robotics has been tracking early stage robotics startups and supporting them as they grow. Many of these companies are creating fundamentally new interactions and products, and as they do so, are leveraging the latest business model concepts, including various twists on “Robots as a Service” and “cloud robotics”. With so much new ground being broken, we saw a need to share their stories so that the industry as a whole can learn and grow, too. 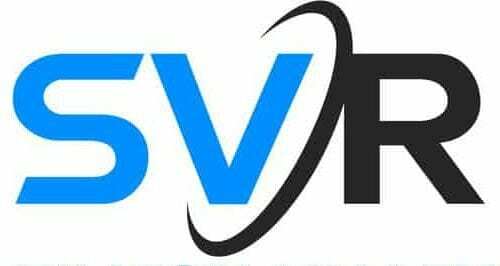 Our first report on “Service Robotics Case Studies in Silicon Valley 2015” looked at enterprise robotics companies like Fetch Robotics, Adept, Fellow Robots, and Savioke, who occupied the space between backroom logistics and front-of-house customer service. 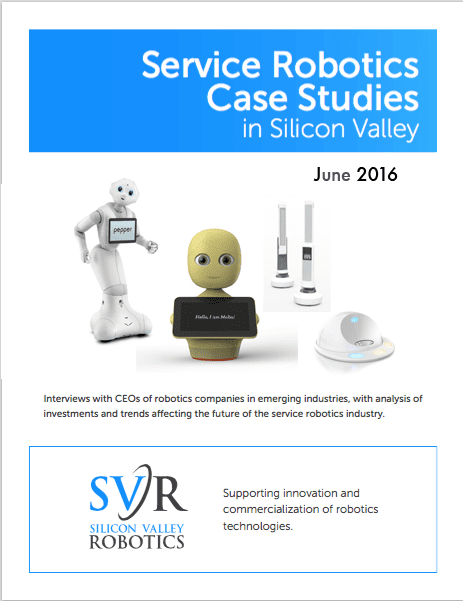 The new “Service Robotics Case Studies in Silicon Valley 2016” takes a deeper dive to explore how robotics companies are driving changes in how we interact — not just with technology — but with our pets, our health care providers, and our retail experience. A clear theme is that each of these robotics startups can unlock data-driven insights with potentially enormous additional business upside by leveraging the ubiquitous connectivity that is being made possible by cloud computing, and more specifically, cloud robotics. Emerging cloud robotics technology enables far more than the simple ability to continuously update and upgrade a physical product, or even to augment the intelligence of that product; it allows robots to become active mobile big data collectors. Another important theme is how the RaaS or “Robots as a Service” model is maturing, with a range of transactions and applications (e.g. commission-based vs rental-based etc.) to complement the roll out of cloud robotics. Robots are no longer being marketed as simple products for sale, but as sophisticated tools for gaining insights and creating value and driving customer change. Our second set of case studies and commentaries looks at how accelerators and investors are supporting the drive towards RaaS and finding business models that map robotics technologies into existing business structures, in areas ranging from health to consumer, hospitality to retail. Every case study and commentary in this report underscores the fundamental importance (and reliance) of human-robot interaction to the service robotics business model — a trend that is sure define the industry well into the future. With so many ‘humans in the loop’ it will become critical that we design robots and businesses that set a high bar for safety, privacy, and ethics. For this reason, we are pleased to announce that Silicon Valley Robotics has just launched a “Good Robot Design Council” with industry expert advisors in an effort to develop design guidelines for the robotics industry that can help fill the ethical gap between standards and laws. To that same end, our next service robotics reports will focus on self-driving vehicles, agriculture, and other ‘niche’ verticals, with an emphasis on the increasing importance of human-robot interaction, and a look at which aspects of design make good robots and successful businesses.